How many Facebook pages does one guy need? I ask the question because Brad Pattison has set up yet another Facebook page. The list of pages now includes, the Brad Pattison [BP] personal page, the BP public page, the BP fan club page, BP K9 Rescue Team group, At the End of My Leash group, Puppy SOS TV group, Puppy SOS public page, Dog Rescue Vacations group, Dogland TV page and the latest addition being the Brad Pattison Training page. Before getting to his new page, perhaps it’s wise to touch upon his last two failures; Dog Rescue Vacations and the related Dogland TV. Dog Rescue Vacations was Pattison’s attempt to monetize street dogs and get people to pay for his winter Mexican getaway. The choice to ‘rescue’ dogs in Mexico seems strange given his views about these dogs. The idea never took off. He managed to get one trip funded by his franchisees; he advertised for a second trip but luckily it never materialized and looks like he has abandoned this venture. The dedicated website no longer exists. With Dogland, Pattison again tried to capitalize on the suffering of street dogs and this time not just for beach money but as a way to get back on television. His Indigogo campaign aimed to raise $300K. The public response was definitive; he raised less than 1% if his target. Shame, it sounded really exciting. So what is Brad Pattison Training? I couldn’t really tell you based on his introductory statement. He uses words but only to betray the English language; not to form complete sentences or present coherent ideas. I guess we’ll just have to look to his behavior to see what Brad Pattison Training is all about. “A person must be willing to set aside ego to listen to the dog. ” – is he listening the the dog struggling to breathe? ← Kevin, you keep using that word. Geezus, is he trying to kill those poor dogs? this jerk should be taken off the air.. ANIMAL Abuse! Are the owners STUPID? TO STAND AND WATCH THEIR DOGS BE JERKED OVER AN OVER BY HIS NECK? slapped across the nose…..this guy has anger issues he needs a leash on his neck.. I would love to snap it ..maybe he will get trachea collapse. Good you are exposing this stuff. I cannot believe these people still exist with all the science that prove their methods wrong! I can’t believe that people buy in to this stuff and are willing to treat their dogs like this. So very sad. 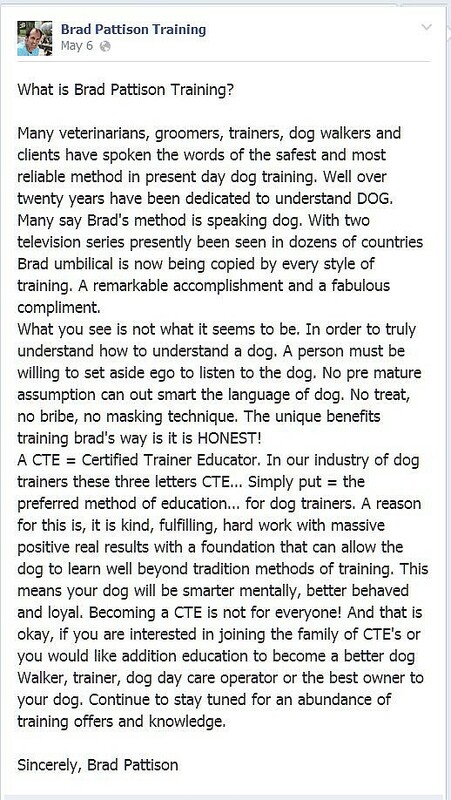 I’ve not heard of a CTE–is this something that certifies trainers in Canada? I’m thinking that is where this guy’s from. I cannot find it on Google either. It’s his “made up” certification that he charges people for. I’ve been told by someone that took the course (and has since left his organization) that he charges $7000 now. Dog training throughout the world is not regulated. Anyone can create a “be a certified dog trainer” program and charge money for it. Yes, even the high school kid down the street. A CTE is a trainer certified through Brad Pattison’s program. There is very little to say really, just hope he will not get a show on National Geographic! This is unbelievably horrible. I got a knot in my stomach when I realized what was going on in the clips. Please expose this abusive fraud all you can. Disgusting! People actually pay this man to abuse their dogs. OMG why doesn’t that girl in the ponytail just grab her dog and leave? He probably bullies the owners too. He does bully the owners, and will even hit them. I know of one person who he hit, who was on his show, though they stopped filming after the second day because of the way he treated them and their dogs. Just came home from a day at a busy public dog show with my 9 month old pup. She was calm, social and friendly. I did have treats with me. I did give her some when other dogs charged her space and when one dog passed by lunging and trying to bite her. The owner of the other dog was correcting their dog. People can say that I use “bribes” if they want. My dog did amazing. The proof is in the pudding. My interest is piqued as well…is it science based info? No intimidation?